Get Ready For Summer With Our ProCurves Plus Giveaway! StressNoMore wants to help you to get ready for summer with our fabulous giveaway! 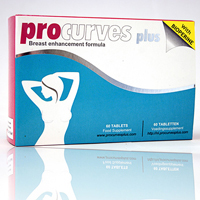 We have four boxes of ProCurves Plus breast enhancement formula to give away! Each pack, worth £39.99, contains with a two week supply of ProCurves supplement. ProCurves Plus is a revolutionary 100% natural food supplement designed to increase the size and firmness of your breasts. ProCurves Plus contains Pueraria Lobata, a herbal extract which works to increase microcirculation and blood flow in order to stimulate breast tissue growth.It also contains BioPerine, a patented ingredient which helps your body to absorb the other natural ingredients in ProCures Plus. The natural ingredients of the ProCurves Plus have oestrogen-related characteristics which can help to promote the growth of the thin breast tissue, for a safe and natural way to fuller, firmer breasts. If you want to increase your self-esteem and confidence ready for summer not enter our competition? To be in with a chance of winning, simply comment on this blog telling us why you should win. Make sure you leave your email address (we won't publish it) so that we know how to contact you if you win. Competition closes 31st March 2013, and winners will be notified by 5th April.